It’s that time of year again…back to school! Since half of Opal & Ruby Gift Emporium is actually a full-time third grade teacher, the new school year is a very big deal to us! And when Kelli (our Ruby) goes back to school, we all go back to school! 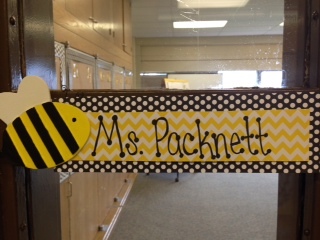 Last school year started off a little frantic and a little rocky for Ms. Packnett. Upon moving to Fort Wayne nearly two years ago, the right teaching job didn’t present itself immediately. But, when it finally did, it came a few days after the 2013-2014 school year had already started. Long gone was the summer, which historically always presented prep time for Kelli. The summer is not only a break for teachers, but much needed time to re-group, get organized, regain focus, and prepare for the new school year. Kelli and her class made it through the year with a lot of success, but battled many snow days, interruptions, and a lot of change. Fast forward to this summer, and it was a brand new ballgame. Ms. Packnett already knew she would be in the same classroom, looping with her same class, making her a third grade teacher this year. Last year’s classroom was cute, but it was definitely thrown together. It didn’t quite have the Kelli feel because she had to hit the ground running in a school year that had already started. We (Ms. Packnett and her team of supporters!) did the best we could do. When we regrouped this summer for brainstorming sessions, the ideas flowed like a river! There was time, direction, volunteers, and a lot of fun! 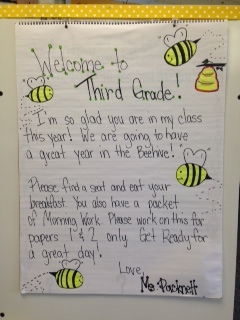 Visit Kelli’s classroom this year, and you’d be welcomed to The Beehive! The happy yellow and black motif is not only cute, it’s inviting! 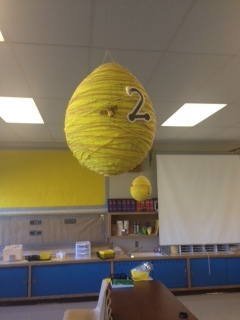 (sounds a lot like Ms. Packnett) Kelli is definitely the Queen Bee of the Hive, and her worker bees were all-a-buzz to help build the classroom. Our dear friend Karyn volunteered many hours and blessed Kelli and her classroom with brand new black and yellow crates that Kelli is using as cubby storage units! 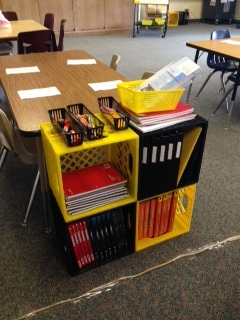 They help the classroom stay organized and lookin’ good! 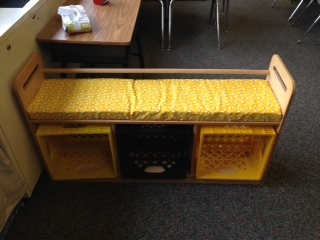 Our mother, the ultra creative one in the group, created a bee-themed bench seat for the students! 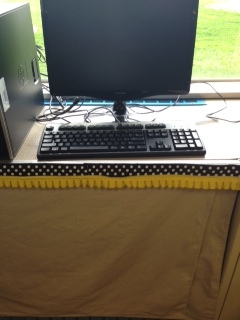 Kelli sewed a curtain system that covers storage areas. She used a painters’ canvas drop cloth and cute ribbon! 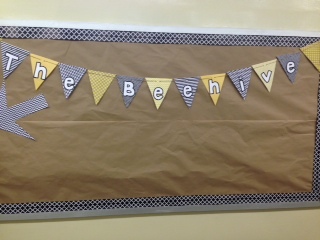 With a big sigh of relief DAYS before the school year began, Kelli’s room was ready, and she was excited to welcome her little bees to The Beehive! 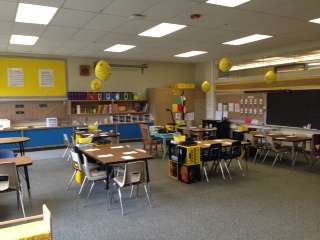 We love teachers and pray that the 2014 – 2015 is a blessed and successful year!